I am in Limerick this evening for a concert in Saint Mary’s Cathedral by the Choir of King’s College, Cambridge. 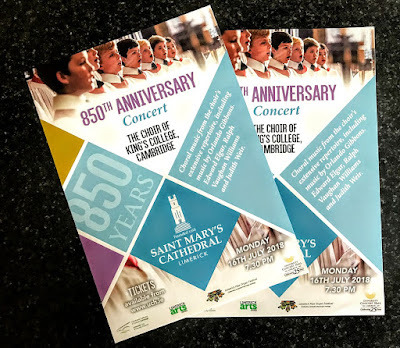 Saint Mary’s Cathedral is marking the 850th anniversary of its foundation and this promises to be the highlight of the musical programme in this year’s celebrations. Saint Mary’s which was a gift to the Church from Donal Mór O’Brien, the last King of Thomond. It has been a site of Christian worship since 1168 and is one of the oldest buildings in Limerick City. 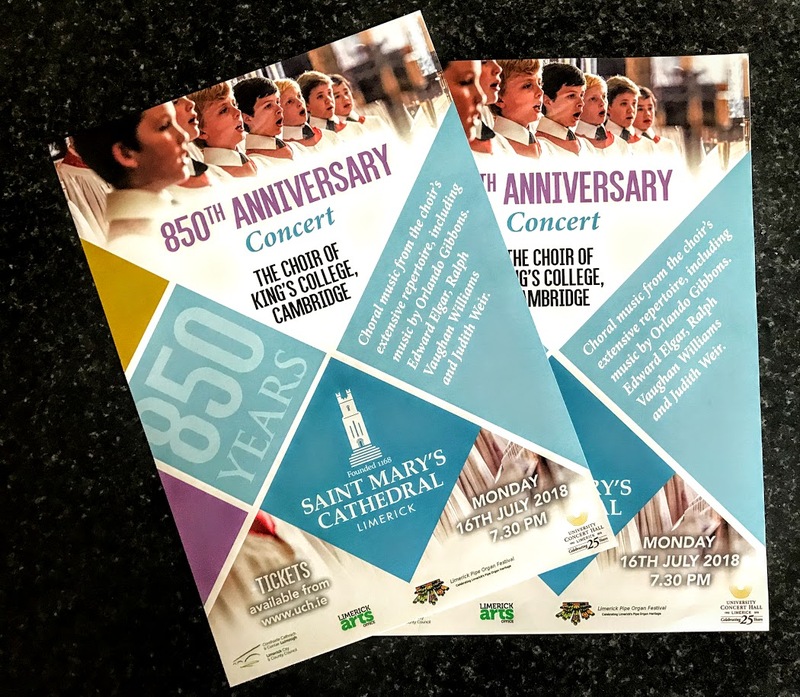 The choir visit forms part of this year’s festivities which are celebrating and promoting the Cathedral in Limerick and beyond. Since early last week, this event has been sold out, no more tickets available and tickets will not be available at the door. As part of the celebrations, I preached at the broadcast Eucharist from Saint Mary’s Cathedral on RTÉ Radio 1 on Sunday morning [15 July 2018]. This evening’s programme includes choral music from the choir’s extensive repertoire, including music by Orlando Gibbons, Edward Elgar, Ralph Vaughan Williams, Herbert Howells, Hubert Parry and Judith Weir. The Choir of King’s College, Cambridge, was founded in the 15th century and is the pre-eminent representative of the British church music tradition. It is most famous for singing A Festival of Nine Lessons and Carols, the Christmas Eve service that the BBC has broadcast from Cambridge since 1928. When King Henry VI founded King’s College in 1441, it was his intention that a choir would provide music for the daily offices and celebrations of the Mass. The College Statutes (1453) stipulate that the college would consist of a Provost, 70 fellows and scholars, and a choir composed of 10 secular chaplains, six stipendiary lay clerks (or ‘singing-men’) and 16 choristers. Henry VI specified that the choristers were to be poor boys, of strong constitution and of ‘honest conversation.’ They had to be under 12 years of age when they were admitted, and able to read and sing. In addition to their choral duties, singing daily Matins, Mass and Vespers, they were to wait at table in Hall. The boys were provided with meals and clothing, and eight pence a week for their board. They were not allowed to wander beyond the college grounds without permission from their Master or the Provost. The earliest record of a permanent schoolmaster dates from 1456, when Robert Brantham, a former Eton and King’s scholar, held the post of master over the choristers, as well as singing in the Choir. Orlando Gibbons, whose work is included in this evening’s programme, entered the choir as a 12 year-old chorister in 1596, probably under the direction of his eldest brother, Edward, who was then the organist. In 1598, Orlando entered the university and gained the degree of Bachelor of Music in 1606. At the age of 21, he was appointed as ‘gentleman’ and Organist of the Chapel Royal by James I.
Gibbons became one of the most versatile English composers of the age. His numerous sacred and secular compositions remain in the repertoire. His death on 5 June 1625 is regularly marked by the singing of his music at Evensong. John Tomkins, brother of the composer Thomas Tomkins, was officially appointed as organist in 1606 and he stayed until 1625. During his tenure, the choir flourished and a very high standard of singing was attained. For a few years in the 1550s under Edward VI, and during the period of the Puritan Commonwealth in the 1650s, choral services in the chapel were suppressed. Sung services were completely suppressed from 1652 to 1660, although the Organist and Master, Henry Loosemore continued to draw his salary from the College. These interruptions aside, the choir has been singing services continuously for over 500 years. Past directors of the choir have included John Tomkins, Harold Darke, Sir David Willcocks, and Sir Philip Ledger. The present choir director is the composer Stephen Cleobury. A Festival of Nine Lessons and Carols was created by Dean Eric Milner-White in 1918, based on a Christmas Eve service that had been introduced by Bishop Benson at Truro Cathedral. The first radio broadcast from King’s College was a Sunday service on 2 May 1926. Then, in 1927 and 1929, the new HMV mobile van visited Cambridge to record the choirs of King’s College and Saint John’s College. However, only two of the recorded tracks were – Bach’s Auf! Auf! Mein Herz (BWV 441) and Gott lebet noch (BWV 46) – released, and then only in 1931. In 1928, A Festival of Nine Lessons and Carols was broadcast on Christmas Eve for the first time. It was broadcast the following year but for reasons that are not clear not in 1930. From 1931, the Festival of Nine Lessons and Carols has been broadcast annually. The Choir exists primarily to sing daily services in King’s College Chapel. But its worldwide fame and reputation, enhanced by its many recordings, has led to invitations to perform around the world. Hubert Parry, Never weather-beaten sail and My soul, there is a country (Songs of Farewell and 1).